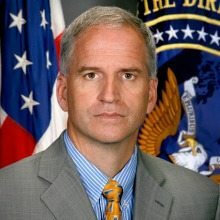 The Intelligence and National Security Alliance (INSA) hosted a leadership dinner Jan. 21 featuring National Geospatial-Intelligence Agency (NGA) Director Robert Cardillo. Director Cardillo provided his vision for positioning NGA in the Intelligence Community (IC) moving forward in his keynote address. According to Cardillo, the future presents a steep curve in the emerging commercial space satellite marketplace. Under his functional management authority, Cardillo is responsible for the standards and interface protocols that ensure new interfaces fit within NGA’s current architecture. “When my analyst sits down to attack an intelligence problem, I don’t want them thinking they must go to the drone screen and figure out the source input,” Cardillo said. “Quite frankly, I want all of these sources to compete with them. That’s why we call it a source marketplace, so they all compete to provide potential answers.” In other words, Cardillo expects the data to flow seamlessly into NGA’s architecture. You don’t have to work in national security to need quick and accurate location data to inform decisions. Cardillo likened NGA’s need for data that informs location with that of a burger chain selecting the next place to open one of its restaurants. So, how does NGA approach determining a location based upon available data? Another topic Cardillo touched upon was NGA’s plans with object-based production. “We’re doing it. It’s not a debate anymore – if it was it’s over and we’re moving on it,” he said. Cardillo used another example – this time, a lighthouse – to illustrate his point. Over the course of a couple of decades, the same lighthouse might have multiple data associated with it, even though it is just one object. According to Cardillo, the premise underlying object-based intelligence is one object, one time, and once the physical object has been revealed from its multiple data entries, analysts – or sailors, as in the case of the lighthouse, can be confident that they know exactly what lies within a given space. Looking to the future, Cardillo sees potential for NGA to lend its expertise to some of the major issues of our time, including the democratization process in emerging countries. For example, he sees potential alliances with the State Department on advancing democracy in countries such as Afghanistan.